Since beginning this blog in conjunction with the publication of my book, Between Heaven & Earth: An Illuminated Torah Commentary (Pomegranate, 2009) I have presented many of its illustrations along with new insights that have grown from the traditional readings and from your questions and comments. 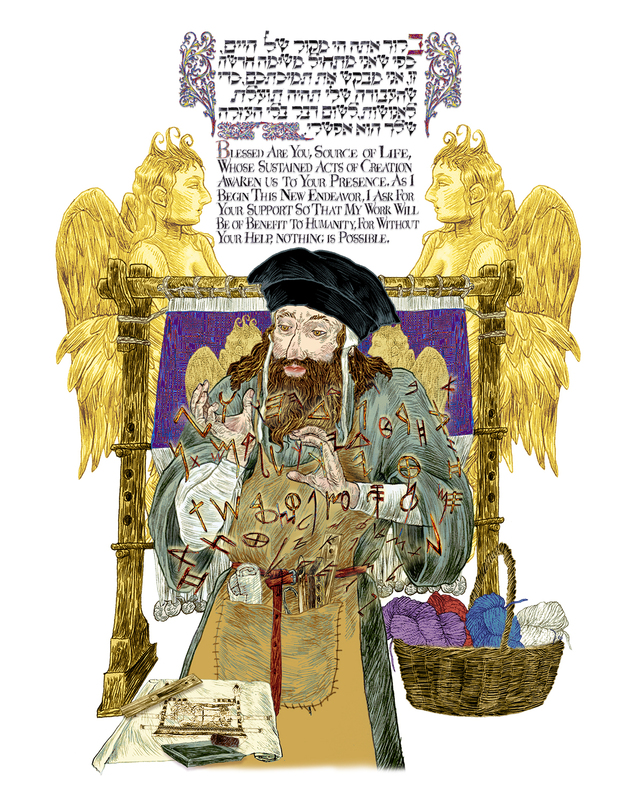 Sometimes, the illustrations themselves have been tweaked to reflect these changes, making my book a continual work in progress.Though I can not pretend to their scholarly stature, I like to imagine this process akin to the conversations and Torah insights of the great 2nd century rabbis and scholars (Amoraim) that were gathered to comprise the Talmud. Accordingly, the illustrations are structured so that each element’s story and symbolism for a parashah enhance each other on its page. So, in this week preceding Pesach/Passover, as we begin the Book of Leviticus with Parasha Vayikra, I was thinking about the concept of sacrifice as more than the ritual slaughter of animals and other material offerings. Sacrifice can also be considered as a tenet of mindfulness. 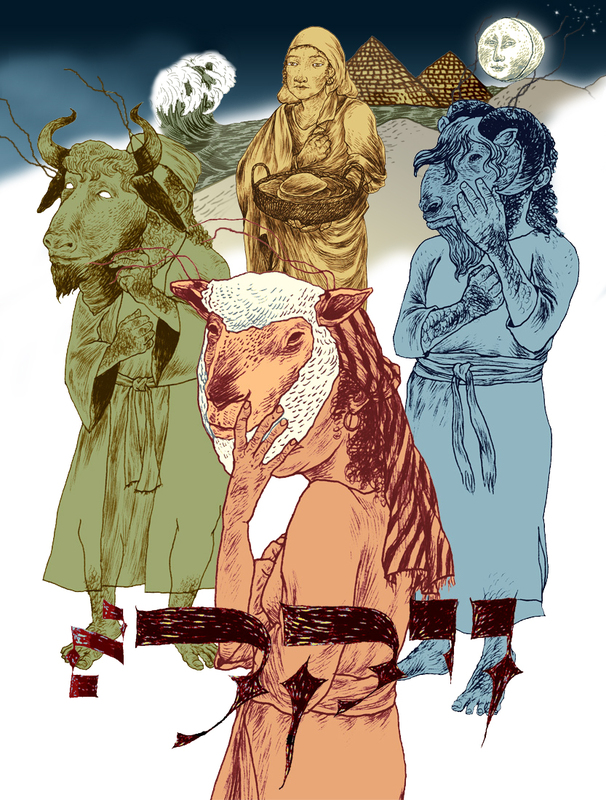 While the Temple stood in Jerusalem, animal sacrifice was at the core of Judaism’s complex practices; fulfilling G-d’s commandments and providing nourishment for the priests. Yet, the parashah also reminds us of its more subtle purpose; to learn the difference between our animal and divinely-based natures and to gain mastery over them so that we may evolve culturally and spiritually. A slight digression: metaphorically, the body of esoteric knowledge of kabbalah understands Creation as a process of ‘tzimtsum’, where G-d contracts/withdraws His/Her Essence to allow all that we know to exist. That said, each time we perform a mitzvah (a commandment or good deed for the benefit of another), we can think of this process as our own microcosmic ‘tzimtsum’. In this way, we are setting aside our ‘animal’ nature (which is characterized by instinctive actions for self-preservation) in favor of our divinely based nature (marked by our mindfulness as a human being and a responsible member of the larger community). Often, there is great pain associated with a transition from one nature to the other, as in the time of the Exodus when the Hebrew slaves coming out of Egypt made the agonizing 40-year transition to becoming Israelites. Though we are many generations removed, we are reminded of that learning process each year when we remove the masks of our animal natures to allow our divinely-based essences to commemorate and celebrate Passover.